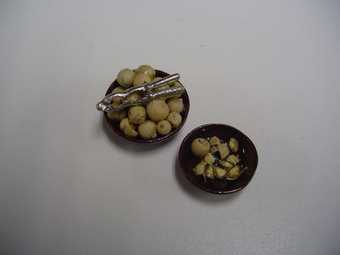 This miniature nut bowl set is done in 1:12 scale. The dollhouse nut bowl set includes a brown ceramic bowl of nuts with a nut cracker on top (attached) and another brow ceramic bowl with a few cracked nut shells in it. Each of the miniature bowls is 0.73" in diameter and 0.29" tall. This Nut Cracker & Bowl Set is supplied by Handcrafted Miniatures By Barb, which generally ships within 1 business day(s) of you placing your order .